After the super hit success of Chekka Chivantha Vaanam, STR is back with Vantha Rajavathaan Varuven, his latest release, directed by Sundar C. This action family drama is the official Tamil remake of Pawan Kalyan’s Attarintiki Daredi, which was a big hit in Tollywood. How good is Vantha Rajavathaan Varuven and will it follow the success of CCV for Simbu? Here is our review. Adhithya / Raja (STR) sets on a mission to bring back his aunt, Nandhini (Ramya Krishnan) back to America, who got separated from the family 25 years back, when she got married to the man she loved, against her father's (Nasser) will. Did Raja succeed in his mission and fulfill his grandfather's interest? Catch the film on the big screens to know! An action family drama of this style and treatment is not new for director Sundar C, who has already dealt with a similar theme in few of his previous ventures. 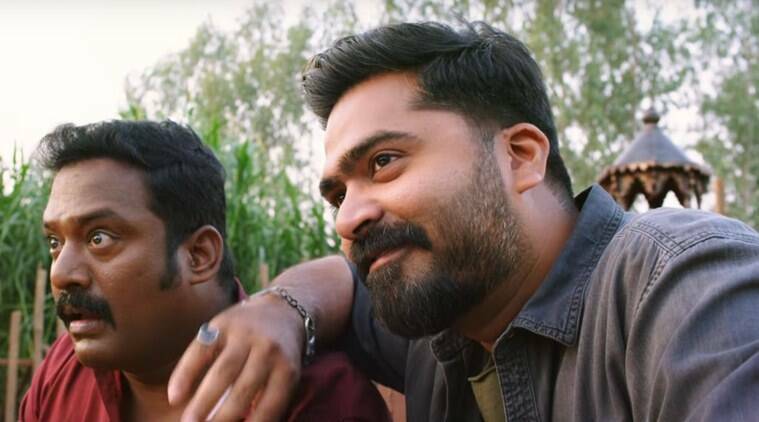 There have been no changes with the screenplay and the team of VRV has recreated the scenes exactly as how it was constructed in the original version, except for the fact that, a few dialogues and scenes have been added to electrify the stardom of STR. The reference dialogues connecting STR’s real life work big time with the audience and the fans. The climax sequence in the railway station gives a convincing finish to this family drama and STR puts up a mature performance there. The family audiences might connect with the family sentiments, however, it might be a doubtful debate for the youngsters and regular film goers. VRV falls flat, especially the latter half with a weakly written set of scenes and execution. Sundar.C’s trademark slapstick comedies look very much repetitive, as we have already had enough of that through his previous outings, including his last film, Kalakalappu 2. The Ahalya drama sequence doesn't bring out any laughs and the need of that scene itself seems questionable. In an unusual manner, Yogi Babu’s comedies do not work in most places and he fails to save the comic angle of the film. The performances and the staging of the scenes look artificial and because of that, the film fails to establish an emotional connect with the audience. The exaggerated stunt sequences add up to the cons of VRV. The biggest drawback of the film is the lack of engagement and freshness, and also, the lack of a mature way of handling the emotions. That in turn, makes the film predictable, and in spite of a new problem, you know, the hero is going to win at last. Though you know that you are going to witness an action masala entertainer, the 'entertainment' factor goes missing. STR looks tailor made for the role of Raja and he has hit the right chords with his body language and performance. It is also good to see the dancer inside Simbu come out with style and high energy through the numbers, 'Red Card', 'Vaanga Machan Vanga'. He seems to be one of the very few saving factors of the film. Though a commercially templated character, Megha Akash does what is expected off her role. However. it’d be interesting to see more of the performer side of the pretty lady. Hiphop Tamizha’s background score sounds loud at places and it gets jarring to the human ears. Gopi Amarnath's visuals and Srikanth NB's cuts are functional and the technical team provides decent support to this commercial potboiler. In a nutshell, VRV is an old wine put into an old bottle which could be found interesting for STR's screen presence. One might also feel that director Sundar C could write refreshing scenes to engage the audience in his upcoming projects, which was once his biggest strength. Verdict - Vantha Rajavathaan Varuven is a templated commercial potboiler with STR being the saving grace!